I didn’t get on a plane until I was 21 years old. JustaBXgirl got on a plane when she was 4 months old. Even though I’ve only been traveling for the past seventeen years I have had some really great experiences in a number of different countries. I look forward to creating new memories with JustaBXgirl while getting our passports stamped around the world. First, though I need to get her a passport. Right now all of our travel is pretty localized. If you remember she had her longest plane ride this summer to California. She has definitely been bitten by the travel bug and has already asked to visit Paris and the Eiffel Tower. Sidenote: I was about her age when I first said I wanted to go to Paris. It took me a while but I loved getting there and I can’t wait to take her as well. She has definitely been bitten by the travel bug and has already asked to visit Paris and the Eiffel Tower. Sidenote: I was about her age when I first said I wanted to go to Paris. It took me a while but I loved getting there and I can’t wait to take her as well. Her interest inspired me to start talking to her a bit more about other countries, cultures, and languages. One of my favorite things to do as a child was to spin my globe and imagine the places I would go one day. 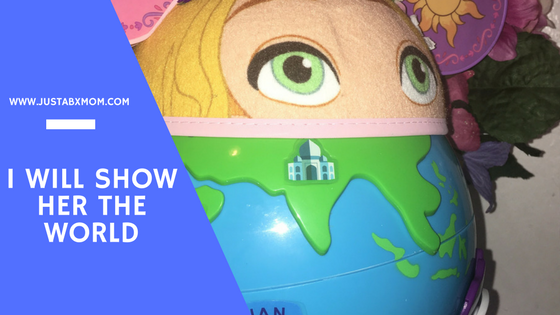 I was really excited when Learning Resources Puzzle Globe arrived because it was the perfect way to introduce geography to our travel plans. JustaBXgirl knows she lives in the Bronx which is in New York which is in the USA which is on Earth. Somewhere along the line, I didn’t think about teaching her that there are continents. So when her globe arrived I had to show her that we live in North America. Then we traveled the world on her globe discussing who and what lived on each continent. She loves looking at how the pyramids in Mexico look different than those in Africa which usually leads us into a discussion about how mummies in South America looked different from mummies in Egypt as well. Of course, JustaBXgirl loves finding the Eiffel Tower in Europe and reminds me each time that she wants to see it in person. And she makes sure to roar when she points out the tiger in Asia. She also reminds me that tigers are solitary animals and maybe that’s why there’s only one on the puzzle piece. Now, interesting fact, JustaBXgirl does not like puzzles. Nope, she’s just never been into them. I’ve tried wooden ones. I’ve tried oversized ones. I’ve tried them all and they are just not her thing. This puzzle globe? She loves. I thought well, at least she’ll learn the continents and some basic geography from the globe even if we never use the puzzle component. Nope. She completely loves taking the pieces out and putting them back together. She has even made her own game where she will label the continents incorrectly then come to me giggling telling me to figure out what is wrong. I’m hoping by color coordinating she begins recognizing the words. This to me is the perfect preschool globe. I think we will also be using it for some time. I look forward to showing her the world through toys like this and in real life. This post totally reminded me of Roo at the same age. I love that she wants to explore the world already.